Jay is a Los Angeles transplant, 2018 Jonathan Larson Grant Recipient, and 2019 Dramatist Guild Foundation Fellow. She met Zeniba Britt at the #BARS workshop at The Public Theater founded by Rafael Casal and Daveed Diggs, where they developed an adaptation of Toni Morrison’s Beloved. They became residency writers there under the supervision of Jeanie O’Hare developing The Loophole, an American Civil War musical. They were commissioned to present part of it at the Public Theater as part of the 50th Anniversary of Hair celebration. She also wrote the lyrics for The Woodsman (New World Stages) and contributed music and lyrics to Jeff Augustin’s The Last Tiger in Haiti (Berkeley Rep/La Jolla Playhouse). BFA Acting Conservatory of Theatre Arts and Film at SUNY Purchase. Rae Binstock grew up in Cambridge MA and attended undergrad at Columbia University. Her plays include land of no mercy (David Ross Fetzer Foundation Theatre Grant, 2017 winner), POSE (O’Neill Conference semifinalist), and We Are The Light of the World (Red Theater’s National Playwriting Competition, 2016 winner). Her plays have been produced and developed with companies such as The Lark Development Center, the Samuel French Off-Off Broadway Festival, Salt Lake Acting Company, The Hearth Theater, and The Fresh Fruit Festival. Erika Dickerson-Despenza is a Blk feminist Pushcart Prize nominated poet-turned-playwright, educator and grassroots organizer from Chicago, Illinois. She’s a 2018-2019 Dramatists Guild Foundation Playwriting Fellow and The Lark’s 2018 Van Lier New Voices Fellow. She is a member of Ensemble Studio Theatre’s Obie-winning Youngblood collective and a New Georges affiliated artist. Her work has been developed at The Lark, New York Stage and Film and Jackalope Theatre and is currently being developed at The Public Theater. Select stage plays include: a water tetralogy examining water as a reflection of Blk women’s bodies as sites of consciousness development and exile during key events in Black History: ocean’s lip/ heaven’s shore (the Middle Passage), took/tied hung/split (Jim Crow), shadow/land (Hurricane Katrina) and cullud wattah (Flint Water Crisis). In addition to this fourfold work, she is currently developing a 10-play Katrina Cycle, focused on the effects of Hurricane Katrina and its state-sanctioned man-made disaster. Mathilde Dratwa is a member of Dorset Theater Festival’s Women Artists Writing Group, a former member of New York Foundation for the Arts’ Immigrant Artist Program and a two-time Pulitzer Center Grant recipient. Her theater credits include Milk and Gall (Great Plains Theater Conference, Jane Chambers award finalist, O’Neill National Playwrights Conference Semi-Finalist) and Escape from Garden Grove (Last Frontier Theater Conference, Maxim Mazumdar New Play Competition Finalist). Her plays have been workshopped and presented by LAByrinth Theater Company (Barn Series) and InProximity Theatre. She wrote and directed the short films PETA PAN (starring Independent Spirit Award Nominee Nisreen Faour) and ESCAPE FROM GARDEN GROVE (Sundance Channel Contest Finalist). A seasoned educator, Mathilde is a Master Teaching Artist for Roundabout Theatre Company, the New Victory, the Shakespeare Society and the School of The New York Times. She is the co-founder of Moms-in-Film. After graduating from Barnard College, Aryanna received a Master’s Degree from Columbia University in the field of Narrative Medicine, combining her passion for writing and patient advocacy. After graduating, she went to work as the personal writing assistant for best-selling author, Erica Jong. In 2013, Aryanna transitioned into television, and worked as the executive assistant for Emmy-Award winning producer and director, Stephanie Laing. Aryanna worked with Stephanie on the HBO award-winning series Veep and Vice Principals. Business School for author and professor, Debora Spar. In 2018, Aryanna, along with composer/lyricist, Benjamin Velez, won the 2018 New Musical Award for their original work, Borderline Aryanna currently lives and writes in Manhattan. Charles Gershman is a playwright and screenwriter. His play Free & Proud recently ran in the UK, selling out London’s Theatre503 and playing at Assembly Festival (Edinburgh Fringe) and the King’s Head Theatre (Off-West End, London). It was published by Oberon Books. His award-winning play The Waiting Game premieres in NYC at 59E59 Theaters in February 2019. Other work has been produced or developed by The Lark, The Playwrights’ Center, PlayPenn, the Kennedy Center, Theatre for the New City, LaMaMa ETC, Primary Stages, FringeNYC, NYU-Tisch School of the Arts, and the University of Central Florida, among others. He has been a teaching artist at the New School’s Eugene Lang College and at Davidson College. MFA: NYU-Tisch (Chair’s Award for Excellence in Dramatic Writing). Kelley has performed on regional stages across the country, internationally, including many shows at the Goodman Theatre, Steppenwolf Theatre, and has been seen on several television shows, including Elementary, Person of Interest, Madam Secretary, Chicago PD, and most recently guest starred on NBC’s Chicago Justice. Also an accomplished playwright, Nambi has penned plays for Steppenwolf and Goodman Theatre in Chicago, Lincoln Center (Director’s Fest) in New York, and internationally. Kelley is in residence at New Victory for 2018-19, was a finalist for the Francesca Primus Award, The Kevin Spacey Foundation Award, and is working on an adaptation of Toni Morrison’s Jazz which is slated for several regional productions in coming seasons. 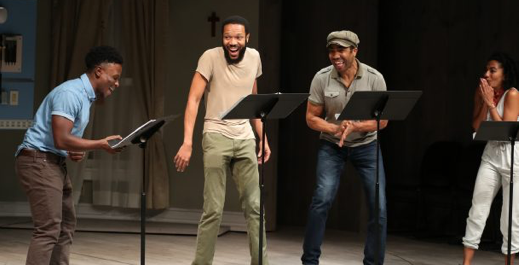 Her adaptation of Native Son (Sam French)has enjoyed productions across the country, most notably, at Yale Repertory Theatre, and will premiere in NYC in 2019. www.nambikelley.com. Melissa Li is a composer, lyricist, performer, and writer. She is a recipient of the Jonathan Larson Award, a 2018-19 Dramatists Guild Foundation Musical Theatre Fellow, a 2018-19 Lincoln Center Theater Writer in Residence, and a former Queer|Art|Mentorship Fellow. Musicals include Interstate (New York Musical Festival, Winner “Outstanding Lyrics”), Surviving the Nian (The Theater Offensive, IRNE Award Winner for “Best New Play” 2007), and 99% Stone (The Theater Offensive). Her works have received support from the National Performance Network, New England Foundation for the Arts, Dixon Place, terraNOVA Collective, The Village Theater, 5th Avenue Theatre, and Musical Theater Factory, among others. Melissa has released music as a solo artist and collaboratively, including 2 Seconds Away, Drive Away Home (as Good Asian Drivers), and The Beginning (as Melissa Li & The Barely Theirs). She is proud to be from Boston, and proud to be based in NYC and Baltimore. Benjamin Velez is a composer/lyricist and Columbia graduate where he wrote the 114th Annual Varsity Show. A member of the BMI workshop since 2010, he won the Harrington Award in 2012. His work has been at the Yale Institute for Music Theater, Ars Nova, NAMT, NYMF, NEO, the Civilians, 4@15, Joe’s Pub, and the York Theater where his musical “Afterland” had a reading directed by Mark Brokaw. He was a 2017 Sundance Artist at the UCROSS Foundation, and a spring 2018 artist in residence. His original musical “Starblasters” had its first reading at Dixon Place this past March, directed by Daniel Goldstein. His musical “Borderline” was the 2018 winner of the Weston Playhouse New Musical Award. His musical “Kiss My Aztec”, written with John Leguizamo, had a reading this year at the Public Theater and will be having its world premiere at Berkeley Rep in 2019.